With more and more activities getting online in everyone’s life, cyber criminals are find new ways each day to grab your sensitive and personal information. When your data is stolen, it can be used to hack your accounts, steal money from account and much more scary things that you can think off. One of the easiest ways which these bad guys use is Keyloggers which can record each and every keystrokes on your system.It captures everything that a user is doing- keystrokes, mouseclicks, files opened and closed, sites visited. What it means? This simple means that all your data is stolen like your passwords, credit card information, your emails, chat conversations etc and anything else you typed on your keyboard. Spyshelter is a great Anti-keylogger tool which can help you protect against these attacks effectively. It offers both a free version and a paid version with a small difference in features. 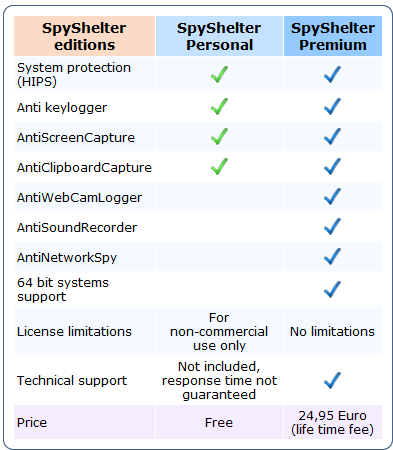 Free version does not offer support for 64 bit Operating system, antiwebcam, anti sound capability. Â· SpyShelter Stop-logger ensures that whatever your type into your computer is protected against dangerous people who steal your data! Whatever you enter into your computer will not leak to malicious parties. Â· SpyShelter guards your registry, your physical memory (RAM), and other sensitive computer parts and processes so that malicious code cannot be injected to seize control of your PC. Â· SpyShelter AntiNetworkSpy protactive module prevents dangerous trojans from stealing your private information while important SSL internet transactions. It also blocks HTTP/HTTPS trojans on user level as well as POP,SMTP,FTP, loggers. Â· SpyShelter shields sensitive data that can be found on you Windows clipboard as a result of copying, cutting, and pasting. This software ensures that these information will not be under malicious monitoring by other people. Â· SpyShelter defends you against hackers who would like to seize control of your webcam, even when it is switched off! Â· When you take screen-captures, SpyShelter spots suspicious activity that might reveal sensitive data you enter into your computer such as bank account and credit card information. Â· SpyShelter unique security module that protects your system against VOIP sound trojan loggers. Can be useful when you use instant messangers for voice calls. This module also protect you against voice logger from your webcam or built-in microphone. It works great but you should be cautious if you have a security product with HIPS capability already installed like Outpost firewall pro. Also, It will keep asking you questions initially about which program to allow or not. Just like any other security product, it brings too many popups, but for a average guy or novice it can be confusing as many of the popups were for windows services. I am just avoiding technical details here, the reason, average guy wont be able to understand whatever I talk technically. Give it a try and hopefully you will like it. But sometime I wonder why the security applications cant be make a bit simpler for those average guys who dontÂ have a clue about what can happen to them online. You can download spyshelter free here.